Because of Ebac's unique "Hot Gas" defrosting feature, the Ebac CD60 will function smoothly in temperatures down to 33°F without frost build up. Designed to survive under adverse conditions and to deliver the goods, this unit will efficiently remove more than fifty-five pints of airborne water vapor per day under standard conditions (80°F, 60%RH), and will exceed 15 gallons per day under the extreme conditions found in problem environments. The Ebac CD60 is a versatile workhorse designed to eliminate high humidity problems in a wide range of applications including offices, laboratories, apartments, storage areas, restaurants, bars, museums, locker rooms, computer, telecommunication rooms and basements. The impressive CD60 can be easily moved from site to site or can be permanently mounted and ducted to suit a variety of applications. It is a quiet, high efficiency, high capacity unit designed to suit your HVAC needs. The CD60 is supplied with a pre-wired, remote humidistat, extra long power cord and long condensate tube. This preassembly makes the installation process simplistic, thereby reducing the overall installation and product cost. 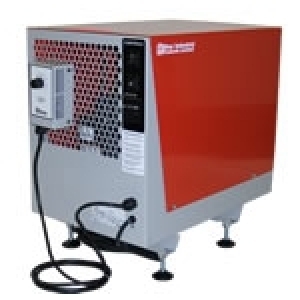 The high efficiency Rotary compressor ensures the maximum extraction with the lowest running costs. Fully adjustable feet ensure the unit can be leveled quickly and accurately. A rugged epoxy-coated, steel chassis. A "floating" compressor for vibration & mobility protection. An adjustable remote humidistat, to control the level of dryness desired. Ebac's unique "Hot Gas" defrosting systems. Standard 115v power requirement for operations in any location. National Trade Supply is one of the largest EBAC Dealers in the United States. We stock many of the EBAC products and accessories in our own facility providing you with a quicker turnaround time and instant tracking information on your order. We have installed EBAC units in a variety of applications and can offer expert advice on how to properly install yours. We are also an authorized service center for EBAC products and can offer warranty service and replacement parts. Whenever there is a need for fast, dependable, energy-efficient drying, Ebac and National Trade Supply can provide the solution.